As my summer arts and crafts project this year, I created six tiny books of poetry. The books are an origami fold with 6 pages and cover art that I created for each book. So every one is unique! It was fun to play with the glue and paints and tissue paper during the summers heat. And I could spread everything across the desk in Mom’s room and cut and paste while she slept. I am offering these for sale $3.50 each or all six for $18.00. I have a link to paypal on The Seasons Bookshop page (couldn’t get the button to show up but the link works). Or if you want to email me directly kathleengeverett@gmail.com we can work out the details. Editing is now my main focus for fall and winter, trying to wrestle some of these passages and poems into coherent shape. The Shack stories are top of the ‘to-do’ list then a little book about rabbits then stacks of poems to sift through. 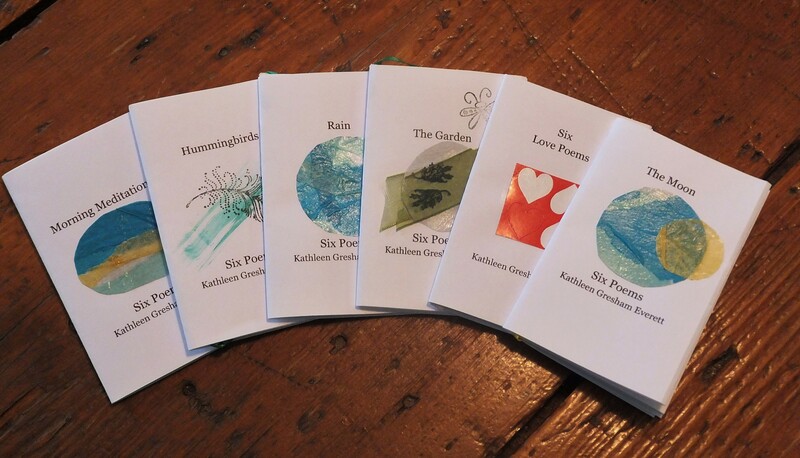 I will keep in touch and leave a poem or two when I can – hope you like my tiny books – they were a joy to create! This entry was posted in Essays, Ozarks, Poems and tagged arts and crafts, poetry, summer project, tiny books of poems, what I did on my summer vacation by The Course of Our Seasons. Bookmark the permalink. What a great idea. I wish you well with them. They were so fun to do! Thanks! Thanks, Barb – really enjoyed creating them. Yay, these are adorable. I love the thought of you working on them in your mom’s room as she dozed. What a cool way to pass the summer. Ever since I first read the Last Really Good Shack stories, I have been eager to buy the book….please do keep it number one on the to do list, your eager audience awaits, LOL.